Rev. Charles McMullen, M.A., M.Litt., B.D. Of other days around me. " So sang Thomas Moore, the Irish poet, in his "National Airs". 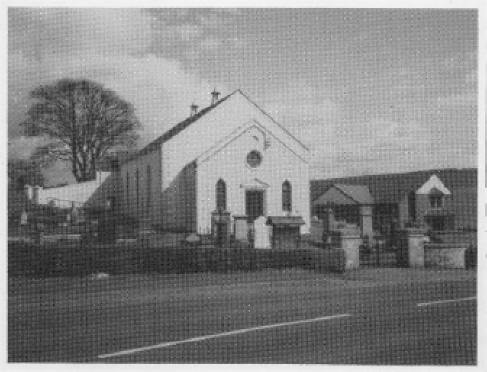 What follows is a series of `fond memories' as Jean Magowan brings alive the history of Legacurry Presbyterian Church. Couched in personal reminiscences and comments, it is her story. Beyond that, she takes us back to the beginning of our story as a congregation in the early nineteenth century. Legacurry came into being at a time of prolific expansion throughout the Irish Presbyterian Church, our General Assembly having been formed in July 1840 as the General and Secession Synods came together. Throughout the generations Jean not only captures the spirit of initiative, enterprise and commitment which has characterised the congregation, but is also honest in mentioning any shortcomings. It is both a pleasure and privilege to commend this short history of the congregation which preserves the essentials of our heritage. It is right that we should look back on years of sturdy witness and give thanks to God. It is fitting to pay tribute to the hands that wrought and the loving hearts that planned. As many will remember `other days around them' in these pages, let us not forget either the importance of keeping alive the faith for this present generation and beyond. Significantly, much has been achieved in the 1970's and the 1980's after the main period of this book, a proud symbol of which is the construction of the new hall complex during the ministry of the Rev. William Campbell. Now as we celebrate one hundred and fifty years since the building of the Church with a Festival of Flowers and a Festival of Faith, we would do well to be reminded of the words of our Senior Minister, the Rev. John McCaughan: "Hats off to the past; coats off to the present". Our forefathers brought faith alive under the power and guiding hand of God. We have the same duty to make the history of our Church His Story. As the Scriptures remind us: `Where there is no vision, the people perish'. In that visionary sense let us preserve the changeless in a changing world. 1. Our Senior Members, Frances Gardner and Lily McComb for sharing their recollections. 2. Cecil Woods for encouragement and reading the script. 3. Mary Simpson for help with research. 4. Myra Ackers for typing the script. 5. The Ulster Star for the use of photogrophs. 6. Summit Printing for valued assistance. 7. The Presbyterian Historical Society. 8. The staff of Stranmillis and Ballynahinch libraries.